Here are some figures from my current book project on piety among Indonesian Muslims. We—Bill Liddle, Saiful Mujani, and I—have constructed a measure of piety at the individual level that encompasses beliefs, rituals, and behavior. We rely heavily on this indicator to show that individual level piety among Indonesian Muslims …. But we can also use our variable to make some descriptive inferences too. 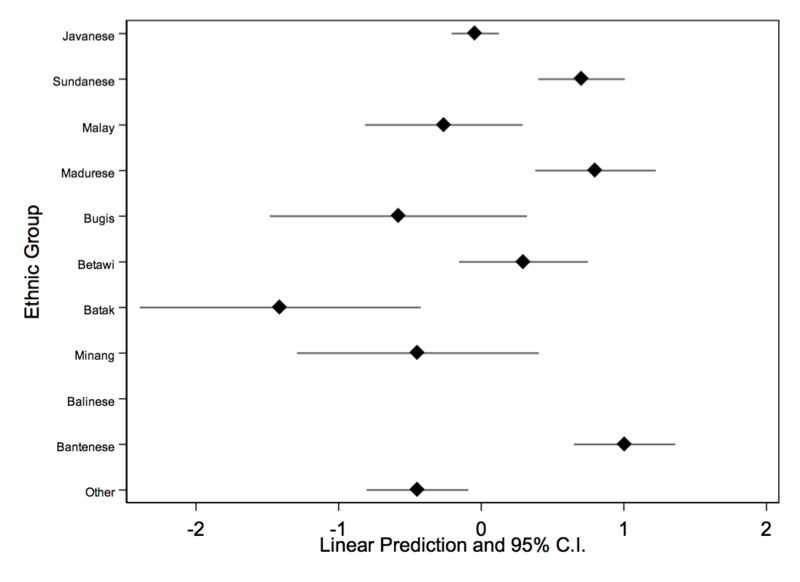 Here, for example, is a plot of predicted piety among respondents in our sample based on ethnicity. This is one of those nice instances in which the quantitative data accord really nicely with our qualitative impressions. Sundanese, Madurese, and Bantenese Muslims tend to score more highly on our piety index than do Javanese Muslims, for example. But there are other, tantalizing bits in here that warrant further qualitative investigation. We see that Muslims in Aceh tend not to be more pious (net of ethnicity) than Muslims in Central Java, although the difference with East Java and Yogya is more pronounced. 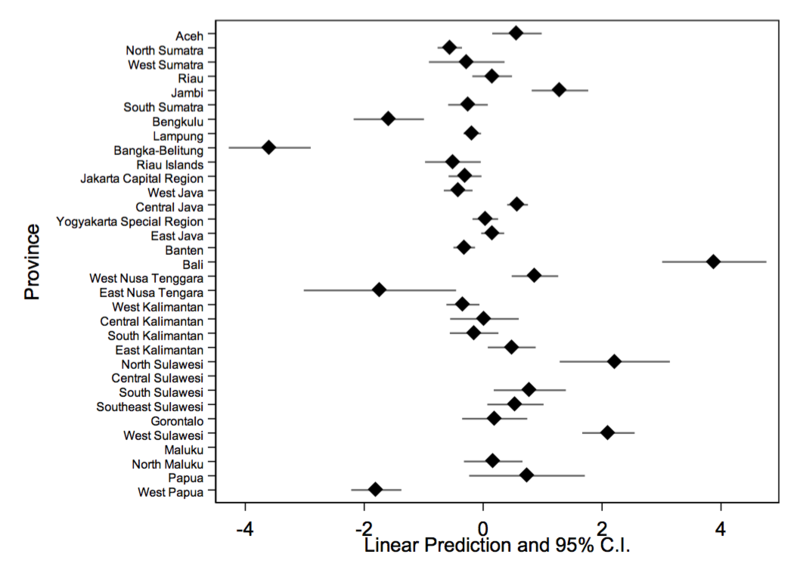 Muslims in the majority Hindu island of Bali tend to be far more pious—by our metric—than Muslims elsewhere in Indonesia, a pattern that we uncover as well among Muslims in majority-protestant North Sulawesi. Muslims in Bangka-Belitung score lowest on our piety index. What explains these findings? There are lots of possibilities, none of which we will be able to answer using surveys. But looking comprehensively at how piety varies is the first step in knowing what questions we need to be asking. I’m not an anthropologist, but as an Indonesian muslims who live/or comes from ethnic where muslim is not the majority tend to over realize that they are a minority and to compensate for this they made the islamic identity more pronounced. My step mom is a balinese muslim, and she used to said that the balinese tradition is being monopolized by hindus, she reasoned that since culture is a fluid construct, then it should be okay for balinese muslim to reinterpretate the ancient tradition so as not to go against their beliefs(i.e burying the dead instead of ngaben cremation). I suspect the same pattern is happening in the other part of Indonesia.